Phil Neville says it’s “imperative” for his England side to be taking on the best teams in the world as preparations for the 2019 World Cup now take a step forward after England secured qualification last month. Neville’s Lionesses take on Brazil on Saturday before a match against Australia on Tuesday night, and with Sweden to come next month, Neville now wants to see his team prove themselves against the best teams in the world. “SheBelieves always offers us that opportunity but I wanted to make sure we are playing top ten teams regularly because they’re going to be our main competition at the World Cup,” he said. Results have been largely positive since Neville took over from Mark Sampson in January. A big win over France at SheBelieves in February was a positive start before a draw against Germany and a defeat to the U.S. followed. England went unbeaten in their qualifiers, securing a World Cup berth with a 3-0 win against group rivals Wales in Newport last month. With Neville getting more and more used to his team and vice versa with every camp, the head coach now feels as though there’s a bigger understanding between him and his players. Neville is also working on what formation is going to be best for England so far but is determined the style of his team will not change no matter who they come up against in France next summer. If England are going to win a World Cup they’re going to do it with the toughest preparation possible. The majority of Neville’s players will endure a long and tough FA WSL season while Jodie Taylor and Rachel Daly will return to the National Women’s Soccer League after a break over the winter. 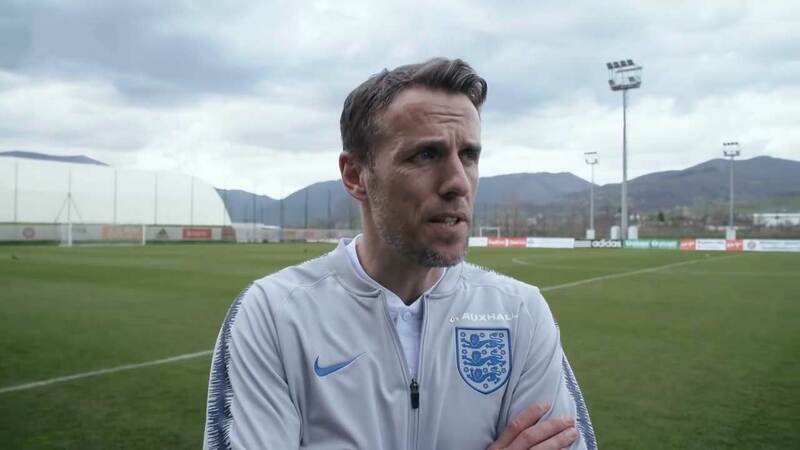 Neville sat down with his squad on Monday at St. George’s Park to explain the plan for the next eight months, a plan which will once again includes the SheBelieves Cup as well as more tough friendlies against the best in the world. Preparation after the games against Brazil and Australia should have taken England to the Netherlands next month but Sarina Wiegman’s side are in the World Cup playoffs and may not be able to fulfill the fixture, though a home match against Sweden is set in stone. Neville also says there are changes for SheBelieves in 2019 and is expecting his side to be facing Japan and Brazil rather than France and Germany. “We’ve heard France and Germany aren’t committed to SheBelieves,” he said. “I think Japan and Brazil are going, that’s been the official line and it’s not been a secret. We’d already committed to the Brazil home game before we knew that so it’s not ideal but it will mean we’re playing against another continent in terms of Japan, who I think are dark horses for the World Cup. Regarding contingency plans for next month, the head coach said England will have an away friendly but the opponent is yet to be confirmed. Neville was at the City Academy to watch Manchester City crash out of the Champions League against Atlético Madrid before the international break. The head coach says he’s “disappointed” but admits it may not be a bad thing for some of his players physically in the long run and praised the overall development of the FA Women’s Super League this season. “City going out of the Champions League will indirectly help us,” he said. “They’ll have more rest but I want my players to play at the top level so I was disappointed for them. In the league, Birmingham are much improved; Reading I always think are horrible to play against. After facing a full-strength Brazil side including Marta, Debinha, and Formiga on Saturday, attention will quickly turn to Tuesday night’s match against a rapidly improving Australia side. But after several of their players endured a tough NWSL season, England won’t be facing the likes of Emily van Egmond, Katrina Gorry, Lydia Williams, or star striker Sam Kerr after head coach Alen Stajcic rested them for the camp, leaving Neville “disappointed” but understanding the decision. Neville, though, has a conundrum of his own in attack. With Taylor withdrawing through injury, another of his regular No. 9s is out of the next couple of camps in the shape of Ellen White. The Birmingham City striker has been in top form over the course of 2018 but Neville says it offers opportunities to other players, particularly reserving praise for Houston Dash striker Rachel Daly. “It gives opportunities to the likes of [Toni] Duggan up there, Daly who’s been fantastic, [Fran] Kirby can go back up there and [Nikita] Parris has been fantastic in her last few games for Manchester City. Neville also reserved praise for captain Steph Houghton who is on her first England camp since the news broke late last month that her husband, professional footballer Stephen Darby, was retiring from football after being diagnosed with motor neurone disease. Neville described the news as “horrific” but praised Houghton’s attitude over the past weeks and says she will have every bit of support needed. Neville added, “She’s fronted it up, she’s gone out and played and I think they’ve been overwhelmed by the well wishes, but it shows how much they’re both well thought of. Steph is in charge of what she wants to do. If she wants to be on camp she can be on camp. If she wants to train, she can train and if she wants to go home, she can go home because at the end of the day it’s a game of football. One bit of good news to come out of the last few weeks was the announcement last week that Team GB will be able to send a women’s football team to the 2020 Olympics in Tokyo should England rank as one of the top three sides at the World Cup next year. Neville described it as an added “incentive” for the tournament but is keen to put all talk of the tournament to the back of his mind for now, but admitted his surprise at his player’s reaction to the news. “It’s exciting for the girls but they can’t look beyond the World Cup. We’ve got to perform but I’ve put talk of the Olympics to one side because if we take our eyes off the World Cup we’ll end up with egg on our face.